Welcome to Women's Integrated Network, WIN, Athy's Website. WIN, Athy is a Voluntary, Not for Profit & Non-Political Women's Network. Its remit is to Empower all Women for Positive Integration through quality Information provision, Skills / Knowledge Acqusition, Training, Potential Development and Social Networking for the common good. On this site, WIN, Athy has tried to upload information that may be of interest to you. These include information about WIN, Athy, Some Past / Upcoming Activities, Photo gallery, links to our Networking colleagues/favourite sites e.t.c. In addition we encourage you to check out , Support/Donations, Publications, WINNING KIDS and much more. We hope you will enjoy your time on our website and pass on the link to your friends and families. We will be glad to know that you visited and to read your comments, so please drop us a line using the contact details. A well Informed Woman is a well Integrated Woman and Together Everyone Achieves More (TEAM). For WIN, Athy, positive integration is when Women are supported to develop their potentials and become Economically, Socially, Culturally, Psychologically, Mentally, Spiritually and Morally empowered to be the best they can be, enhancing the already existing good in all humans and thereby promoting peaceful co-existence. To develop a positively integrated community where all citizens are equal, respected, appreciated, celebrated and empowered to attain their full potential for the common good. brilliant, Watch this space for 2019 !!!!!! Sessions..Watch this space for 2019!!!!! vouchers go to struggling families. Merry Christmas and a wonderful New Year to All. !!!!! Garden and O'Brien's was a blast; watch out for 2018! and it is FREE to attend and participate. Lovely Prizes to be won.
'' 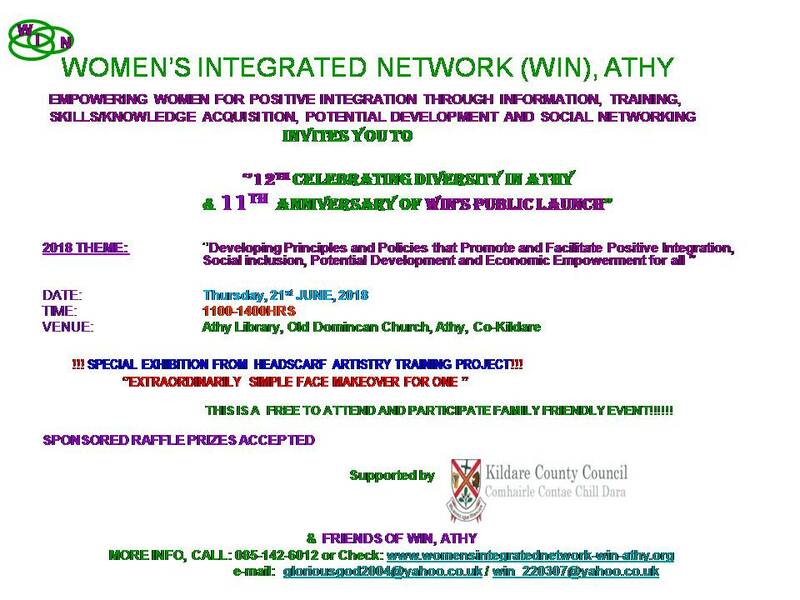 12th Celebrating Diversity in Athy & 11th Anniversary of WIN's Public Launch, Thursday, June, 21st,2018, celebrations were outstanding, Many thanks to County Kildare, Festival Grant.Watch this space for 2019. A free, family friendly and enjoyable event, proudly supported by Friends of WIN & Kildare County Council's Festival Grants. Also checkout WIN Athy on facebook for updates. Check NoticeBoard Page for more and archives.